I did a day travel to Shantiniketan to see Poush Mela on Friday. Went off very early in the morning with every intention to come back by 10 at night. Finally made home well past midnight thanks to a gridlock just outside Calcutta. Next day was Christmas Eve, so no work. Except for the fact that we had called some very close friends for dinner and a tired me would not be at my cooking best. We had planned a Thai dinner, a basic one with three kinds of curries, one obligatory veggie and rice. And the helping hand was absconding for three days. So you can imagine my restlessness at unnecessarily being delayed and sleep deprived. Thankfully, my aunt was in town. The aunt under whose tutelage I practically learned to cook. The aunt who taught me to create lunch out of odds and ends. The aunt who taught me the finer points of ground turkey vis-à-vis ground chicken. The aunt who took me to my first Thai meal. The gawky, uninitiated, callow youth that I was, staring at the bowl of lime scented soup wondering at the sea of difference between that and my then favourite sweet corn soup. She had a cache of lovely curry pastes. The very ethereal green curry, the robust red curry, the exotic Panang curry, the rich Massaman curry, the mellow yellow curry. All in nicely packaged form. Ready to use. Ready to rescue me. I had in mind a mutton (read goat meat) Massaman curry, a chicken and eggplant green curry and a fish in tamarind sauce. 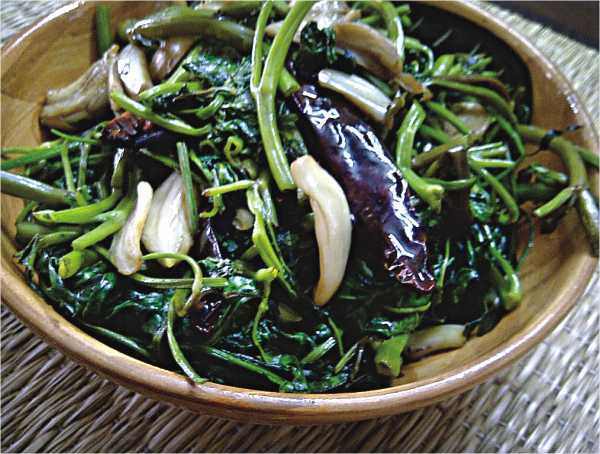 With it, a stir-fried kangkong (kolmishaak for all of us Bangalis). And the ubiquitous fried rice. The magic of supermarket shopping ensured I had ready-to-cook boneless, hassle free meat and fish. While the rest of it was opening a packet and mixing together, some amount of real cooking was involved in the fish. I had to make the tamarind sauce. I took tamarind paste and put nampla (fish sauce), palm sugar (gur) and soy sauce and thinned it down with water. Tasted till the umami hit me. Then I hit the wok with a little oil and a lot of garlic and green chillies. Nutty, fragrant, the kitchen smelled divine in no time. Diffused the sizzle in the wok with my tamarind mixture and slid in lightly fried fish pieces. Grated lots of fresh ginger and scattered chopped scallion. A few minutes later, I had this dark, inviting, almost sticky dish. The sauce was clinging to the fish pieces. The emerald green of scallion illuminating the sauce in slices. The mutton took the most time but the end result was most satisfactory. Massaman curry is the subcontinent's gift to Thailand. Instead of an onion, ginger and garlic sauce, they use coconut cream as the base. And then the flavours are layered with spices that we are very familiar with. A rich brown concoction, that looks like a great mangshor jhol. Green curry is the lightest of them all. Fresh basil leaves and kaffir lime leaves perked up the otherwise sedate curry. Chicken, cut in strips, soaked in all the goodness and became slightly plump and juicy. The cubed eggplants a perfect textural foil to the creamy sauce. But the coup d'état was the dessert. Christmas pudding. Rum soaked dried fruits in a honey scented spice spiked batter, steamed for an hour to tenderness. I even flambéed it for maximum effect. Dinner was an unmitigated success. The cuisine, appreciated. The dessert, swooned over. I was drunk. Part from the cooking. Part from all that rum. With class and grace, boutique Angeleena has passed seven glorious years. For the loyal clients, Angeleena now offers a 5-10 percent discount on their entire range of products. Check out Angeleena's latest offerings -- a fusion of East with West. For details, contact Shop #27, Pink City, Gulshan. Mumu-Maria boutique has opened an outlet in Banani and kicked things off with a winter collection. The collection includes exclusive shalwar kameez sets, frocks, fatuas in cotton chiffon and cotton silk. There are also wedding saris and ladies' bags. And to give its customers a head start for their summer wear, all summer outfits will be available at a 40% discount during the month of January. Address: House 37, Road 6, Block C, Banani. For their valued clients residing in the port city of Chittagong, Ena la mode -- the boutique with exquisite leather products -- is now at Shop #127, First Floor, Afmi Plaza, Nasirabad, Chittagong (#01713048621). Be sure to check out their newest outlet. Bangla Perfume launches "Burberry Body"
The exclusive launching ceremony of Britain's Burberry Body in Bangladesh was held at Bashundhara City Shopping Complex on December 26. 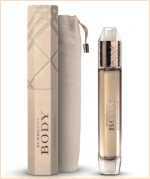 Burberry Body will be available in three different sizes of EDP 85, 65 and 35 ml at all the outlets of (Perfume World) Bangla Perfumes Dist. Ltd at Bashundhara City, Plaza AR, Navana Tower, Polwell Coronation, Uttara in Dhaka and Afmi Plaza at Chittagong. Apart from these Bangla Perfume outlets, Burberry Body can also be purchased from Rainbow Pink City in Gulshan, Artisti Collection and Ecstasy. Along with a host of top celebrities from different sectors of society, media personality Sharmin Lucky and TV actress Munmun were present at the occasion. Kay Kraft, Anjan's, Shada Kalo and their seven other partners at Deshi Dosh have all put their hands together to hold a week long exhibition from 30 December, 2011 to 5 January, 2012 at its premises in Bashundhara City. The exhibition consists of both men's wear and women's wear ranging from shawls to ponchos to mufflers and many such winter garbs, in addition to fatuas, shalwar kameez sets and many more. Nipun even has a household section, displaying bedsheets, and quilts. Staying true to its name, the Deshi Dosh has mainly used the thick, deshi fabrics -- khaadi or khoddor. The colour scheme is mostly in dull shades like black, brown, white or ash. You will find shawls with heavy embroidery to accessorise that plain kameez; ponchos with a wildlife theme at the Shada Kalo stall and white, cotton overcoats and jackets at Bibiana, Nipun and some of the other stalls. Lipi Khandokar, designer at Bibiana states that her collection for this winter has been focused on plain designs and bold single colours because simplicity is the current trend. Rang has however gone for the complete opposite with bold patterns in their long sleeve t-shirts, perfect for their younger clientele. Anjan's has reintroduced the double sided shawls, with a plain side and a designed side, wearable with both plain and printed clothes. A tiny new makeover lounge -- Magic Mirror -- is Farzana Halim Hai's initiative of offering beauty services to the women of the city. “Magic Mirror is a place where I envision my customers to be treated like princesses from a fairy tale, where they will be pampered with utmost care and attention without having to face the hassle of standing in long queues or waiting at a crowded premises” says Farzana. Farzana plans to ensure a fully personalised and dedicated service possible by maintaining an appointment system whereby clients may get themselves appointments prior to visiting the salon thus, ridding them of long waiting periods to be catered to. The parlor, which has a cosy feel to it, offers solutions for one's looks, skin and body care. One can choose from an assortment of conventional beauty services including hair styling and care, make-up, facial and body treatments, hand and foot care etc. Clients may purchase gift vouchers for their near and dear ones along with availing the services themselves. Magic Mirror has designed its services to bring you the best, reduce your stress and tension and re-energise you to take on your role in the busy city life with renewed vigour. Inside the lounge one will find separate beauty stations assigned for different services and the facial zone offers a harmonious set up where one can enjoy facial massage and care. The bridal segment tucked in to a corner of the premises, allowing a full view of the entire lounge, includes jewellery safety lockers which is a rarity in other similar places. Brides will also be indulged with relaxing refreshments while availing Magic Mirror's services. Keeping in mind the fact that working women usually find it difficult to visit beauty salons on days other than weekends, Farzana has chosen to keep Magic Mirror open from 8.30 in the morning, making it possible for these ladies to avail quick services before heading toward work. The subtle play of light, blissful aroma and soothing music teamed with the eco-friendly décor of the place brings over a feeling of peace and tranquility. Make an appointment and visit Magic Mirror at 204/B Tejgaon Gulshan Link Road, Dhaka 1208; Appointment line: +8801610444555.